Read on to access the location and all contact details of the Embassies and Consulates in Ethiopia and nearby locations that our editors have prepared for this occasion. The territory occupied by the Embassy is own by the represented country. Its mission is to promote the interests of his country in the host nation, promoting friendly relations between the two countries, promote economic, cultural, scientific, etc, producing state visits, both commercial and political treaties, among a lot of other functions. The Consulates are responsible for processing visas and permits for people wishing to visit their country and provide assistance and financial help to needy compatriots or other emergency. Even in case of conflicts, wars, inviolability of diplomatic premises is respected. The diplomatic legations get pleasure from a special status: they are inviolable. The security forces of a country can't enter a room enjoying diplomatic protection under any circumstances. Make contact with us if there is any any of all Embassies and Consulates in Ethiopia not know or have not integrated in our system. We've deeply investigated the official sites of each country to deliver you the closest Consulates in Ethiopia you will need to solve the efforts you have outstanding. Access to this section for a detailed listing of all Chinese consulates, embassies and representative offices located near Ethiopia. ConsulBy supplies all Indian citizens with an updated and verified list of all Indian consular offices so they can contact them with any unexpected situation although in Ethiopia and its surroundings. Have a look employing this link a collection of all US embassies and consular offices placed around Ethiopia, just in case you need assistance whilst you're abroad. Check the Nigerian diplomatic mission in Ethiopia, responsible for providing assistance and support to any Nigerian person when they are visiting the country. Access to this section for a detailed listing of all Russian consulates, embassies and representative offices located near Ethiopia. ConsulBy supplies all German citizens with an updated and verified list of all German consular offices so they could contact them with any unexpected circumstance while in Ethiopia and its surroundings. Have a look using this link a collection of all French embassies and consular offices placed around Ethiopia, just in case you need assistance although you're abroad. Check the British diplomatic mission in Ethiopia, responsible for supplying assistance and support to any British person even though they are visiting the country. It is nearly impossible to visit Ethiopia bypassing Addis Ababa (with 2.757.729 inhabitants). 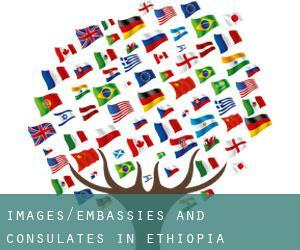 ConsulBy currently has an extensive catalog of Consular Office in Addis Ababa and surroundings. The embassies and consulates located in Ethiopia and exist to help their compatriots to solve any dilemma as if they were back residence. Stick to the link to find out all Consulate and Embassy in Nazrēt and its surroundings. Diplomatic missions are usually in populations with greater number of inhabitants. With 252.279 residents Ethiopia is one of the most influential centers of population Ethiopia. Problems with Ethiopia authorities? Contact instantly with any from the diplomatic missions borwsed for Gondar to find the top resolution with all the local authorities. One on the busiest centers of population Ethiopia is, devoid of any doubt Mekele with 215.546 inhabitants, making it a good candidate to host one or more Embassy in Mekele. We have classified all embassies by nearest town. Given that Bahir Dar is one of the six largest cities of Ethiopia, with approximately 168.899 inhabitants, it is likely that hosts several consulates.